Monthly, quarterly, and yearly sprinkler system inspections are a major part of protecting your business from fire. Automatic sprinkler systems are extremely important for protecting your business. When they are properly maintained, these systems reduce the risk of a person dying by 50 to 75 percent, according to the Congressional Office of Compliance. It is extremely important for business owners to maintain their sprinkler system in order to avoid malfunctions when they are needed. Your sprinkler system should be inspected at least once per year by a professional sprinkler system inspector. But many companies choose to inspect their fire protection equipment monthly and quarterly to avoid any malfunctions. In addition to regular inspections, your sprinkler system should be inspected whenever it is discharged or when a modification is made to the system or your building. But what is involved in the inspection? Let’s take a look at the sprinkler system inspection checklist. The gauges on systems with low air or nitrogen pressure alarms. Doing a monthly visual inspection will allow you to monitor your system and to call for help if something is not right with your system. Test the water flow alarm by opening the test connection on a wet pipe system and the bypass connection on a dry pipe system. If your sprinkler system is hydraulic, inspect the hydraulic nameplate to make sure it is attached and visible. Make sure your fire department connections are visible and undamaged. 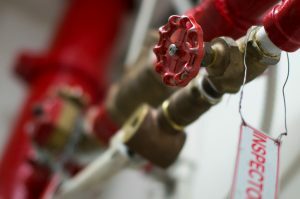 Make sure the gaskets and valves of the fire department connections are not leaking or damaged. Inspect the pressure reducing valves and relief valves. This inspection is more involved than the monthly inspection and should be done once every three months. Conduct a main drain water flow test to determine if there has been a change in the conditions of the water supplied through the backflow preventer or pressure reducing valve. These inspections are a vital part of keeping your business safe from sprinkler system malfunctions and to keeping your building up to code. For more information on Fireline’s Sprinkler System Inspections, call us today! This entry was posted on Friday, August 19th, 2016 at 3:04 pm. Both comments and pings are currently closed.